AVONEX® (Interferon beta-1a) is a 166 amino acid glycoprotein with a predicted molecular weight of approximately 22,500 daltons. It is produced by recombinant DNA technology using genetically engineered Chinese Hamster Ovary cells into which the human interferon beta gene has been introduced. The amino acid sequence of AVONEX® is identical to that of natural human interferon beta. Using the World Health Organization (WHO) natural interferon beta standard, Second International Standard for Interferon, Human Fibroblast (Gb-23-902-531), AVONEX® has a specific activity of approximately 200 million international units (IU) of antiviral activity per mg of Interferon beta-1a determined specifically by an in vitro cytopathic effect bioassay using lung carcinoma cells (A549) and Encephalomyocarditis virus (ECM). AVONEX® 30 mcg contains approximately 6 million IU of antiviral activity using this method. The activity against other standards is not known. Comparison of the activity of AVONEX® with other Interferon betas is not appropriate, because of differences in the reference standards and assays used to measure activity. A vial of AVONEX® is formulated as a sterile, white to off-white lyophilized powder for intramuscular injection after reconstitution with supplied diluent (Sterile Water for Injection, USP). Each vial of reconstituted AVONEX® contains 30 mcg of Interferon beta-1a; 15 mg Albumin (Human), USP; 5.8 mg Sodium Chloride, USP; 5.7 mg Dibasic Sodium Phosphate, USP; and 1.2 mg Monobasic Sodium Phosphate, USP, in 1.0 mL at a pH of approximately 7.3. A prefilled syringe of AVONEX® is formulated as a sterile liquid for intramuscular injection. Each 0.5 mL (30 mcg dose) of AVONEX® in a prefilled glass syringe contains 30 mcg of Interferon beta-1a, 0.79 mg Sodium Acetate Trihydrate, USP; 0.25 mg Glacial Acetic Acid, USP; 15.8 mg Arginine Hydrochloride, USP; and 0.025 mg Polysorbate 20 in Water for Injection, USP at a pH of approximately 4.8. Interferons are a family of naturally occurring proteins and glycoproteins that are produced by eukaryotic cells in response to viral infection and other biological inducers. Interferon beta, one member of this family, is produced by various cell types including fibroblasts and macrophages. Natural interferon beta and Interferon beta-1a are glycosylated, with each containing a single N-linked complex carbohydrate moiety. Glycosylation of other proteins is known to affect their stability, activity, aggregation, biodistribution, and half-life in blood. However, the effects of glycosylation of interferon beta on these properties have not been fully defined. Interferons are cytokines that mediate antiviral, antiproliferative and immunomodulatory activities in response to viral infection and other biological inducers. Three major interferons have been distinguished: alpha, beta, and gamma. Interferons alpha and beta form the Type I class of interferons, and interferon gamma is a Type II interferon. These interferons have overlapping but clearly distinct biological activities. Interferon beta exerts its biological effects by binding to specific receptors on the surface of human cells. This binding initiates a complex cascade of intracellular events that leads to the expression of numerous interferon-induced gene products and markers. These include 2', 5'-oligoadenylate synthetase, (beta) 2 -microglobulin, and neopterin. These products have been measured in the serum and cellular fractions of blood collected from patients treated with AVONEX®. The specific interferon-induced proteins and mechanisms by which AVONEX® exerts its effects in multiple sclerosis have not been fully defined. Clinical studies conducted in multiple sclerosis patients showed that interleukin 10 (IL-10) levels in cerebrospinal fluid were increased in patients treated with AVONEX® compared to placebo. Serum IL-10 levels were increased 48 hours after intramuscular (IM) injection of AVONEX® and remained elevated for 1 week. However, no relationship has been established between absolute levels of IL-10 and clinical outcome in multiple sclerosis. Pharmacokinetics of AVONEX® in multiple sclerosis patients have not been evaluated. The pharmacokinetic and pharmacodynamic profiles of AVONEX® in healthy subjects following doses of 30 mcg through 75 mcg have been investigated. Serum levels of AVONEX® as measured by antiviral activity are slightly above detectable limits following a 30 mcg IM dose, and increase with higher doses. After an IM dose, serum levels of AVONEX® typically peak between 3 and 15 hours and then decline at a rate consistent with a 10 hour elimination half-life. Serum levels of AVONEX® may be sustained after IM administration due to prolonged absorption from the IM site. Systemic exposure, as determined by AUC and C max values, is greater following IM than subcutaneous (SC) administration. Subcutaneous administration of AVONEX® should not be substituted for intramuscular administration. Subcutaneous and intramuscular administration have been observed to have non-equivalent pharmacokinetic and pharmacodynamic parameters following administration to healthy volunteers. Biological response markers (e.g., neopterin and (beta) 2 -microglobulin) are induced by AVONEX® following parenteral doses of 15 mcg through 75 mcg in healthy subjects and treated patients. Biological response marker levels increase within 12 hours of dosing and remain elevated for at least 4 days. Peak biological response marker levels are typically observed 48 hours after dosing. The relationship of serum AVONEX® levels or levels of these induced biological response markers to the mechanisms by which AVONEX® exerts its effects in multiple sclerosis is unknown. The clinical effects of AVONEX® in multiple sclerosis were studied in two randomized, multicenter, double-blind, placebo-controlled studies in patients with multiple sclerosis. 1,2 Safety and efficacy of treatment with AVONEX® beyond 3 years is not known. In Study 1, 301 patients received either 30 mcg of AVONEX® (n=158) or placebo (n=143) by IM injection once weekly. Patients were entered into the trial over a 2 ½ year period, received injections for up to 2 years, and continued to be followed until study completion. Two hundred eighty-two patients completed 1 year on study, and 172 patients completed 2 years on study. There were 144 patients treated with AVONEX® for more than 1 year, 115 patients for more than 18 months and 82 patients for 2 years. All patients had a definite diagnosis of multiple sclerosis of at least 1 year duration and had at least 2 exacerbations in the 3 years prior to study entry (or 1 per year if the duration of disease was less than 3 years). At entry, study participants were without exacerbation during the prior 2 months and had Kurtzke Expanded Disability Status Scale (EDSS 3 ) scores ranging from 1.0 to 3.5. Patients with chronic progressive multiple sclerosis were excluded from this study. The primary outcome assessment was time to progression in disability, measured as an increase in the EDSS score of at least 1.0 point that was sustained for at least 6 months. An increase in EDSS score reflects accumulation of disability. This endpoint was used to ensure that progression reflected permanent increase in disability rather than a transient effect due to an exacerbation. Secondary outcomes included exacerbation frequency and results of magnetic resonance imaging (MRI) scans including gadolinium (Gd)-enhanced lesion number and volume and T2-weighted (proton density) lesion volume. Additional secondary endpoints included 2 upper limb (tested in both arms) and 3 lower limb function tests. Twenty-three of the 301 patients (8%) discontinued treatment prematurely. Of these, 1 patient treated with placebo (1%) and 6 patients treated with AVONEX® (4%) discontinued treatment due to adverse events. Thirteen of these 23 patients remained on study and were evaluated for clinical endpoints. 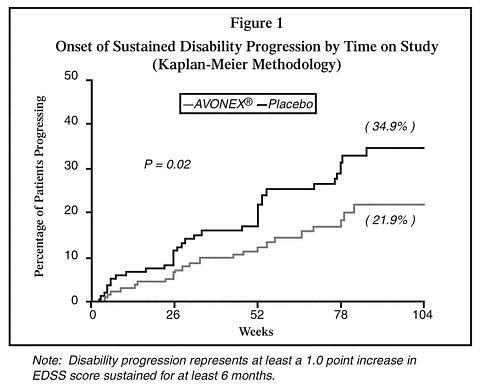 Time to onset of sustained progression in disability was significantly longer in patients treated with AVONEX® than in patients receiving placebo (p = 0.02). The Kaplan-Meier plots of these data are presented in Figure 1. The Kaplan-Meier estimate of the percentage of patients progressing by the end of 2 years was 34.9% for placebo-treated patients and 21.9% for AVONEX®-treated patients, indicating a slowing of the disease process. This represents a 37% relative reduction in the risk of accumulating disability in the AVONEX®-treated group compared to the placebo-treated group. The distribution of confirmed EDSS change from study entry (baseline) to the end of the study is shown in Figure 2. There was a statistically significant difference between treatment groups in confirmed change for patients with at least 2 scheduled visits (136 placebo-treated and 150 AVONEX®-treated patients; p = 0.006; see Table 1). The rate and frequency of exacerbations were determined as secondary outcomes. For all patients included in the study, irrespective of time on study, the annual exacerbation rate was 0.67 per year in the AVONEX®-treated group and 0.82 per year in the placebo-treated group (p = 0.04). AVONEX® treatment significantly decreased the frequency of exacerbations in the subset of patients who were enrolled in the study for at least 2 years (87 placebo-treated patients and 85 AVONEX®-treated patients; p = 0.03; see Table 1). Gd-enhanced and T2-weighted (proton density) MRI scans of the brain were obtained in most patients at baseline and at the end of 1 and 2 years of treatment. Gd-enhancing lesions seen on brain MRI scans represent areas of breakdown of the blood brain barrier thought to be secondary to inflammation. Patients treated with AVONEX® demonstrated significantly lower Gd-enhanced lesion number after 1 and 2 years of treatment (p </= 0.05; see Table 1). The volume of Gd-enhanced lesions was also analyzed, and showed similar treatment effects (p </= 0.03). Percentage change in T2-weighted lesion volume from study entry to Year 1 was significantly lower in AVONEX®-treated than placebo-treated patients (p = 0.02). A significant difference in T2-weighted lesion volume change was not seen between study entry and Year 2. The exact relationship between MRI findings and the clinical status of patients is unknown. The prognostic sig-nificance of MRI findings in these studies has not been evaluated. Of the limb function tests, only 1 demonstrated a statistically significant difference between treatment groups (favoring AVONEX®). A summary of the effects of AVONEX® on the clinical and MRI endpoints of this study is presented in Table 1. Note: (N: , ) denotes the number of evaluable placebo and AVONEX® patients, respectively. 1 Patient data included in this analysis represent variable periods of time on study. 2 Analyzed by Mantel-Cox (logrank) test. 3 Analyzed by Mann-Whitney rank-sum test. 4 Analyzed by Cochran-Mantel-Haenszel test. 5 Analyzed by likelihood ratio test. In Study 2, 383 patients who had recently experienced an isolated demyelinating event involving the optic nerve, spinal cord, or brainstem/cerebellum, and who had lesions typical of multiple sclerosis on brain MRI, received either 30 mcg AVONEX® (n = 193) or placebo (n = 190) by IM injection once weekly. All patients received intravenous steroid treatment for the initiating clinical exacerbation. Patients were enrolled into the study over a two-year period and followed for up to three years or until they developed a second clinical exacerbation in an anatomically distinct region of the central nervous system. Sixteen percent of subjects on AVONEX® and 14% of subjects on placebo withdrew from the study for a reason other than the development of a second exacerbation 2 . The primary outcome measure was time to development of a second exacerbation in an anatomically distinct region of the central nervous system. Secondary outcomes were brain MRI measures, including the cumulative increase in the number of new or enlarging T2 lesions, T2 lesion volume compared to baseline at 18 months, and the number of Gd- enhancing lesions at 6 months. Time to development of a second exacerbation was significantly delayed in patients treated with AVONEX® compared to placebo (p = 0.002). 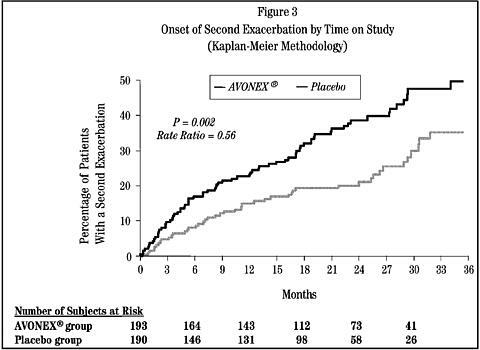 The Kaplan-Meier estimates of the percentage of patients developing an exacerbation within 24 months were 38.6% in the placebo group and 21.1% in the AVONEX® group (Figure 3). 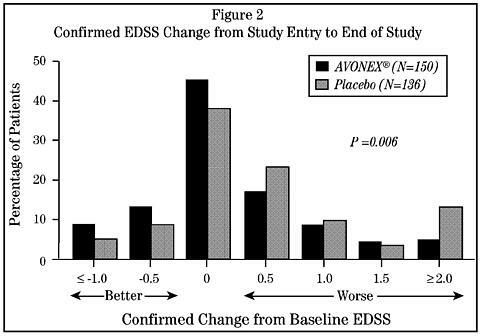 The relative rate of developing a second exacerbation in the AVONEX® group was 0.56 of the rate in the placebo group (95% confidence interval 0.38 to 0.81). The brain MRI findings are described in Table 2. AVONEX® (Interferon beta-1a) is indicated for the treatment of patients with relapsing forms of multiple sclerosis to slow the accumulation of physical disability and decrease the frequency of clinical exacerbations. Patients with multiple sclerosis in whom efficacy has been demonstrated include patients who have experienced a first clinical episode and have MRI features consistent with multiple sclerosis. Safety and efficacy in patients with chronic progressive multiple sclerosis have not been established. AVONEX® is contraindicated in patients with a history of hypersensitivity to natural or recombinant interferon beta, or any other component of the formulation. The lyophilized vial formulation of AVONEX® is contraindicated in patients with a history of hypersensitivity to albumin (human). AVONEX® should be used with caution in patients with depression or other mood disorders, conditions that are common with multiple sclerosis. Depression and suicide have been reported to occur with increased frequency in patients receiving interferon compounds, including AVONEX®. Patients treated with AVONEX® should be advised to report immediately any symptoms of depression and/or suicidal ideation to their prescribing physicians. If a patient develops depression or other severe psychiatric symptoms, cessation of AVONEX® therapy should be considered. In Study 2, AVONEX®-treated patients were more likely to experience depression than placebo-treated patients. An equal incidence of depression was seen in the placebo-treated and AVONEX®-treated patients in Study 1. Additionally, there have been post-marketing reports of depression, suicidal ideation and/or development of new or worsening of pre-existing other psychiatric disorders, including psychosis. Some of these patients improved upon cessation of AVONEX® dosing. Anaphylaxis has been reported as a rare complication of AVONEX® use. Other allergic reactions have included dyspnea, orolingual edema, skin rash and urticaria (see ADVERSE REACTIONS ). Decreased peripheral blood counts in all cell lines, including rare pancytopenia and thrombocytopenia, have been reported from post-marketing experience (see ADVERSE REACTIONS ). Some cases of thrombocytopenia have had nadirs below 10,000/µL. Some cases reoccur with rechallenge (see ADVERSE REACTIONS ). Patients should be monitored for signs of these disorders (see Precautions : Laboratory Tests ). Severe hepatic injury, including cases of hepatic failure, has been reported rarely in patients taking AVONEX®. Asymptomatic elevation of hepatic transaminases has also been reported, and in some patients has recurred upon rechallenge with AVONEX®. In some cases, these events have occurred in the presence of other drugs that have been associated with hepatic injury. The potential risk of AVONEX® used in combination with known hepatotoxic drugs or other products (e.g. alcohol) should be considered prior to AVONEX® administration, or when adding new agents to the regimen of patients already on AVONEX®. Patients should be monitored for signs of hepatic injury (see Precautions : Laboratory Tests ). The lyophilized vial of AVONEX® contains albumin, a derivative of human blood. Based on effective donor screening and product manufacturing processes, it carries an extremely remote risk for transmission of viral diseases. A theoretical risk for transmission of Creutzfeldt-Jakob disease (CJD) also is considered extremely remote. No cases of transmission of viral diseases or CJD have been identified for albumin. The prefilled syringe of AVONEX® does not contain albumin. Caution should be exercised when administering AVONEX® to patients with pre-existing seizure disorders. In the two placebo-controlled studies in multiple sclerosis, 4 patients receiving AVONEX® experienced seizures, while no seizures occurred in the placebo group. Three of these 4 patients had no prior history of seizure (see ADVERSE REACTIONS ). It is not known whether these events were related to the effects of multiple sclerosis alone, to AVONEX®, or to a combination of both. The effect of AVONEX® administration on the medical management of patients with seizure disorder is unknown. Patients with cardiac disease, such as angina, congestive heart failure, or arrhythmia, should be closely monitored for worsening of their clinical condition during initiation and continued treatment with AVONEX®. While AVONEX® does not have any known direct-acting cardiac toxicity, during the post-marketing period infrequent cases of congestive heart failure, cardiomyopathy, and cardiomyopathy with congestive heart failure have been reported in patients without known predisposition to these events, and without other known etiologies being established. In rare cases, these events have been temporally related to the administration of AVONEX®. In some of these instances recurrence upon rechallenge was observed. Autoimmune disorders of multiple target organs have been reported post-marketing including idiopathic thrombocytopenia, hyper- and hypothyroidism, and rare cases of autoimmune hepatitis have also been reported. Patients should be monitored for signs of these disorders (see Precautions : Laboratory Tests ) and appropriate treatment implemented when observed. All patients should be instructed to read the AVONEX® Medication Guide supplied to them. Patients should be cautioned not to change the dosage or the schedule of administration without medical consultation. Patients should be informed of the most serious (see WARNINGS ) and the most common adverse events associated with AVONEX® administration, including symptoms associated with flu syndrome (see ADVERSE REACTIONS ). Symptoms of flu syndrome are most prominent at the initiation of therapy and decrease in frequency with continued treatment. Concurrent use of analgesics and/or antipyretics may help ameliorate flu-like symptoms on treatment days. Patients should be cautioned to report depression or suicidal ideation (see WARNINGS ). Patients should be advised about the abortifacient potential of AVONEX® (see Precautions : Pregnancy--Teratogenic Effects ). If a woman becomes pregnant while taking AVONEX®, she should be advised to consider enrolling in the AVONEX® Pregnancy Registry by calling 1-800-456-2255. The prefilled syringe cap contains dry natural rubber. When a physician determines that AVONEX® can be used outside of the physician's office, persons who will be administering AVONEX® should receive instruction in reconstitution and injection, including the review of the injection procedures. If a patient is to self-administer, the physical ability of that patient to self-inject intramuscularly should be assessed. The first injection should be performed under the supervision of a qualified health care professional. A puncture-resistant container for disposal of needles and syringes should be used. Patients should be instructed in the technique and importance of proper syringe and needle disposal and be cautioned against reuse of these items. In addition to those laboratory tests normally required for monitoring patients with multiple sclerosis, complete blood and differential white blood cell counts, platelet counts, and blood chemistries, including liver function tests, are recommended during AVONEX® therapy (see WARNINGS : Decreased Peripheral Blood Counts and PRECAUTIONS : Cardiomyopathy and Congestive Heart Failure , and Autoimmune Disorders ). During the placebo-controlled studies in multiple sclerosis, these tests were performed at least every 6 months. There were no significant differences between the placebo and AVONEX® groups in the incidence of liver enzyme elevation, leukopenia, or thrombocytopenia. However, these are known to be dose-related laboratory abnormalities associated with the use of interferons. Patients with myelosuppression may require more intensive monitoring of complete blood cell counts, with differential and platelet counts. Thyroid function should be monitored periodically. If patients have or develop symptoms of thyroid dysfunction (hypo- or hyperthyroidism), thyroid function tests should be performed according to standard medical practice. No formal drug interaction studies have been conducted with AVONEX®. In the placebo-controlled studies in multiple sclerosis, corticosteroids or ACTH were administered for treatment of exacerbations in some patients concurrently receiving AVONEX®. In addition, some patients receiving AVONEX® were also treated with anti-depressant therapy and/or oral contraceptive therapy. No unexpected adverse events were associated with these concomitant therapies. However, the potential for hepatic injury should be considered when AVONEX® is used in combination with other products associated with hepatic injury, or when new agents are added to the regimen of patients already on AVONEX® (see WARNINGS : Hepatic Injury ). Carcinogenesis: No carcinogenicity data for AVONEX® are available in animals or humans. Mutagenesis: AVONEX® was not mutagenic when tested in the Ames bacterial test and in an in vitro cytogenetic assay in human lymphocytes in the presence and absence of metabolic activation. These assays are designed to detect agents that interact directly with and cause damage to cellular DNA. AVONEX® is a glycosylated protein that does not directly bind to DNA. Impairment of Fertility: No studies were conducted to evaluate the effects of AVONEX® on fertility in normal women or women with multiple sclerosis. It is not known whether AVONEX® can affect human reproductive capacity. Menstrual irregularities were observed in monkeys administered AVONEX® at a dose 100 times the recommended weekly human dose (based upon a body surface area comparison). Anovulation and decreased serum progesterone levels were also noted transiently in some animals. These effects were reversible after discontinuation of drug. Treatment of monkeys with AVONEX® at 2 times the recommended weekly human dose (based upon a body surface area comparison) had no effects on cycle duration or ovulation. The accuracy of extrapolating animal doses to human doses is not known. In the placebo-controlled studies in multiple sclerosis, 5% of patients receiving placebo and 6% of patients receiving AVONEX® experienced menstrual disorder. If menstrual irregularities occur in humans, it is not known how long they will persist following treatment. Pregnancy Category C: The reproductive toxicity of AVONEX® has not been studied in animals or humans. In pregnant monkeys given AVONEX® at 100 times the recommended weekly human dose (based upon a body surface area comparison), no teratogenic or other adverse effects on fetal development were observed. Abortifacient activity was evident following 3 to 5 doses at this level. No abortifacient effects were observed in monkeys treated at 2 times the recommended weekly human dose (based upon a body surface area comparison). Although no teratogenic effects were seen in these studies, it is not known if teratogenic effects would be observed in humans. There are no adequate and well-controlled studies with interferons in pregnant women. If a woman becomes pregnant or plans to become pregnant while taking AVONEX®, she should be informed of the potential hazards to the fetus, and discontinuation of AVONEX® therapy should be considered. If a woman becomes pregnant while taking AVONEX®, consider enrolling her in the AVONEX® Pregnancy Registry by calling 1-800-456-2255. It is not known whether AVONEX® is excreted in human milk. Because of the potential of serious adverse reactions in nursing infants, a decision should be made to either discontinue nursing or to discontinue AVONEX®. Safety and effectiveness of AVONEX® in pediatric patients below the age of 18 years have not been evaluated. Clinical studies of AVONEX® did not include sufficient numbers of patients aged 65 and over to determine whether they respond differently than younger patients. Depression, suicidal ideation, and new or worsening other psychiatric disorders have been observed to be increased in patients using interferon compounds including AVONEX® (see WARNINGS : Depression and Suicide ). Anaphylaxis and other allergic reactions have been reported in patients using AVONEX® (see WARNINGS : Anaphylaxis ). Decreased peripheral blood counts have been reported in patients using AVONEX® (see WARNINGS : Decreased Peripheral Blood Counts ). Hepatic injury, including hepatic failure, hepatitis, and elevated serum hepatic enzyme levels, has been reported in post-marketing experience (see WARNINGS : Hepatic Injury ). Seizures, cardiovascular adverse events, and autoimmune disorders also have been reported in association with the use of AVONEX® (see Precautions ). The adverse reactions most commonly reported in patients associated with the use of AVONEX® were flu-like and other symptoms occurring within hours to days following an injection. Symptoms can include myalgia, fever, fatigue, headaches, chills, nausea, and vomiting. Some patients have experienced paresthesias, hypertonia and myasthenia. The most frequently reported adverse reactions resulting in clinical intervention (e.g., discontinuation of AVONEX®, or the need for concomitant medication to treat an adverse reaction symptom) were flu-like symptoms and depression. Because clinical trials are conducted under widely varying conditions, adverse reaction rates observed in the clinical trials of AVONEX® cannot be directly compared to rates in clinical trials of other drugs and may not reflect the rates observed in practice. The data described below reflect exposure to AVONEX® in 351 patients, including 319 patients exposed for 6 months, and 288 patients exposed for greater than one year in placebo-controlled trials. The mean age of patients receiving AVONEX® was 35 years, 74% were women and 89% were Caucasian. Patients received either 30 mcg AVONEX® or placebo. Table 3 enumerates adverse events and selected laboratory abnormalities that occurred at an incidence of at least 2% higher frequency in AVONEX®-treated subjects than was observed in the placebo group. Reported adverse events have been classified using standard COSTART terms. No AVONEX®-treated patients attempted suicide in the two placebo-controlled studies. In Study 2, AVONEX®-treated patients were more likely to experience depression than placebo-treated patients (20% in AVONEX® group vs. 13% in placebo group). The incidences of depression in the placebo-treated and AVONEX®-treated patients in Study 1 were similar. In Study 1, suicidal tendency was seen more frequently in AVONEX®-treated patients (4% in AVONEX® group vs. 1% in placebo group) (see WARNINGS ). Seizures have been reported in 4 of 351 AVONEX®-treated patients in the placebo-controlled studies, compared to none in the placebo-treated patients (see Precautions : Seizures ). The following adverse events have been identified and reported during post-approval use of AVONEX®: New or worsening other psychiatric disorders, and anaphylaxis (see WARNINGS ). Autoimmune disorders including autoimmune hepatitis, idiopathic thrombocytopenia, hyper- and hypothyroidism, and seizures in patients without prior history (see Precautions ). Infrequent reports of congestive heart failure, cardiomyopathy, and cardiomyopathy with congestive heart failure with rare cases being temporally related to the administration of AVONEX® (see Precautions : Cardiomyopathy and Congestive Heart Failure ). Decreased peripheral blood counts in all cell lines, including rare pancytopenia and thrombocytopenia (see WARNINGS : Decreased Peripheral Blood Counts ). Some cases of thrombocytopenia have had nadirs below 10,000/µL. Some of these cases reoccur upon rechallenge. Hepatic injury, including hepatic failure and elevated serum hepatic enzyme levels, some of which have been severe, has been reported post-marketing (see WARNINGS : Hepatic Injury ). Meno- and metrorrhagia, rash (including vesicular rash), and rare cases of injection site abscess or cellulitis that may require surgical intervention have also been reported in post-marketing experience. Because reports of these reactions are voluntary and the population is of an uncertain size, it is not always possible to reliably estimate the frequency of the event or establish a causal relationship to drug exposure. AVONEX® has also been evaluated in 290 patients with diseases other than multiple sclerosis, primarily chronic viral hepatitis B and C, in which the doses studied ranged from 15 mcg to 75 mcg, given SC, 3 times a week, for up to 6 months. Inflammation at the site of the subcutaneous injection was observed in 52% of treated patients in these studies. Subcutaneous injections were also associated with the following local reactions: injection site necrosis, injection site atrophy, injection site edema and injection site hemorrhage. None of the above was observed in the multiple sclerosis patients participating in Study 1. Injection site edema and injection site hemorrhage were observed in multiple sclerosis patients participating in Study 2. As with all therapeutic proteins, there is a potential for immunogenicity. In recent studies assessing immunogenicity in multiple sclerosis patients administered AVONEX® for at least 1 year, 5% (21 of 390 patients) showed the presence of neutralizing antibodies at one or more times. The clinical significance of neutralizing antibodies to AVONEX® is unknown. These data reflect the percentage of patients whose test results were considered positive for antibodies to AVONEX® using a two-tiered assay (ELISA binding assay followed by an antiviral cytopathic effect assay), and are highly dependent on the sensitivity and specificity of the assay. Additionally, the observed incidence of neutralizing activity in an assay may be influenced by several factors including sample handling, timing of sample collection, concomitant medications, and underlying disease. For these reasons, comparison of the incidence of antibodies to AVONEX® with the incidence of antibodies to other products may be misleading. Anaphylaxis has been reported as a rare complication of AVONEX® use. Other allergic reactions have included dyspnea, orolingual edema, skin rash and urticaria (see WARNINGS : Anaphylaxis ). There is no evidence that abuse or dependence occurs with AVONEX® therapy. However, the risk of dependence has not been systematically evaluated. Safety of doses higher than 60 mcg once a week have not been adequately evaluated. The maximum amount of AVONEX® that can be safely administered has not been determined. The recommended dosage of AVONEX® (Interferon beta-1a) is 30 mcg injected intramuscularly once a week. AVONEX® is intended for use under the guidance and supervision of a physician. Patients may self-inject only if their physician determines that it is appropriate and with medical follow-up, as necessary, after proper training in intramuscular injection technique. 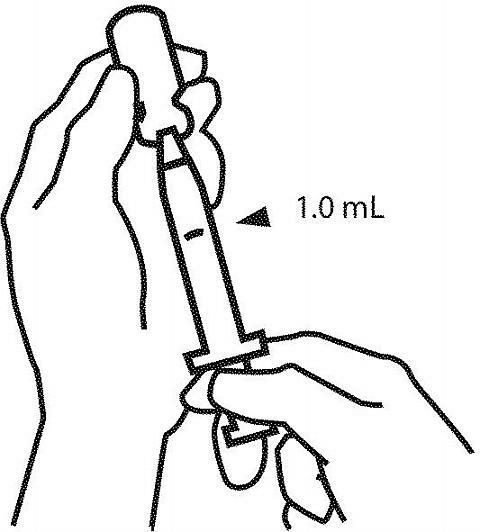 Sites for injection include the thigh or upper arm (see Medication Guide ). Use appropriate aseptic technique during the preparation of AVONEX®. To reconstitute lyophilized AVONEX®, use a sterile syringe and MICRO PIN® to inject 1.1 mL of the supplied diluent, Sterile Water for Injection, USP, into the AVONEX® vial. Gently swirl the vial of AVONEX® to dissolve the drug completely. DO NOT SHAKE. The reconstituted solution should be clear to slightly yellow without particles. Inspect the reconstituted product visually prior to use. Discard the product if it contains particulate matter or is discolored. Each vial of reconstituted solution contains 30 mcg/1.0 mL Interferon beta-1a. 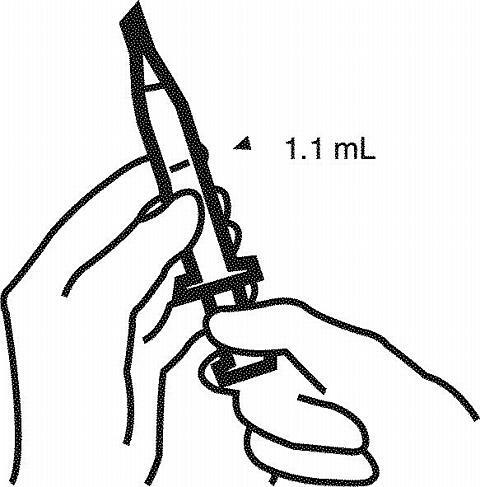 Withdraw 1.0 mL of reconstituted solution from the vial into a sterile syringe. Replace the cover on the MICRO PIN® and attach the sterile 23 gauge, 1 ¼ inch needle and inject the solution intramuscularly. The AVONEX® and diluent vials are for single-use only; unused portions should be discarded. 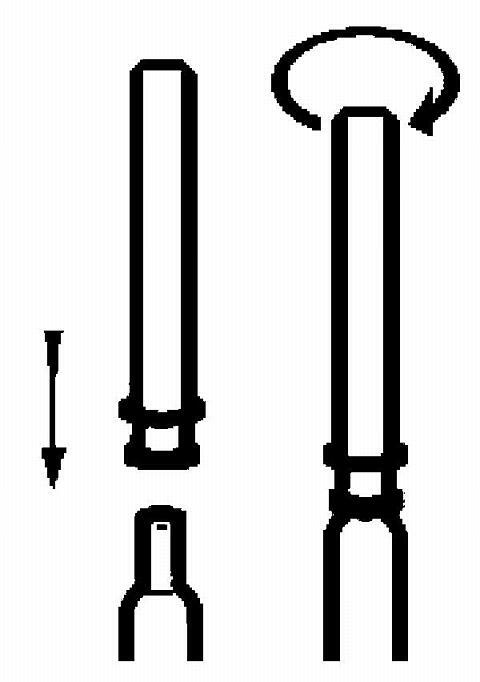 The AVONEX® prefilled syringe should be held upright (rubber cap faces up). Remove the protective cover by turning and gently pulling the rubber cap in a clockwise motion. 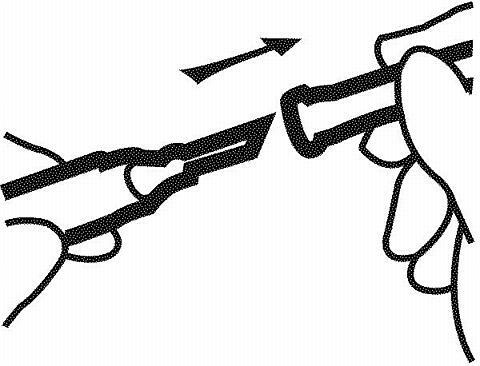 Attach the 23 gauge, 1 ¼ inch needle and inject the solution intramuscularly. The AVONEX® prefilled syringe is for single-use only. A vial of AVONEX® is supplied as a lyophilized powder in a single-use vial containing 33 mcg (6.6 million IU) of Interferon beta-1a; 16.5 mg Albumin (Human), USP; 6.4 mg Sodium Chloride, USP; 6.3 mg Dibasic Sodium Phosphate, USP; and 1.3 mg Monobasic Sodium Phosphate, USP, and is preservative-free. Diluent is supplied in a single-use vial (Sterile Water for Injection, USP). AVONEX® lyophilized vials are available in the following package configuration (NDC 59627-001-03): A package containing four Administration Dose Packs (each containing one vial of AVONEX®, one 10 mL diluent vial, two alcohol wipes, one gauze pad, one 3 mL syringe, one MICRO PIN® * vial access pin, one 23 gauge, 1 ¼ inch needle, and one adhesive bandage). A prefilled syringe of AVONEX® is supplied as a sterile liquid albumin-free formulation containing 30 mcg of Interferon beta-1a, 0.79 mg Sodium Acetate Trihydrate, USP; 0.25 mg Glacial Acetic Acid, USP; 15.8 mg Arginine Hydrochloride, USP; and 0.025 mg Polysorbate 20 in Water for Injection, USP. Each prefilled glass syringe contains 0.5 mL for IM injection. AVONEX® prefilled syringes are available in the following package configuration (NDC 59627-002-05): A package containing four Administration Dose Packs (each containing one single-use syringe of AVONEX® and one 23 gauge, 1 ¼ inch needle), and a recloseable accessory pouch containing 4 alcohol wipes, 4 gauze pads, and 4 adhesive bandages. Vials of AVONEX® must be stored in a 2-8°C (36-46°F) refrigerator. Should refrigeration be unavailable, vials of AVONEX® can be stored at 25°C (77°F) for a period of up to 30 days. DO NOT EXPOSE TO HIGH TEMPERATURES. DO NOT FREEZE. Protect from light. Do not use beyond the expiration date stamped on the vial. Following reconstitution, it is recommended the product be used as soon as possible within 6 hours stored at 2-8°C (36-46°F). DO NOT FREEZE RECONSTITUTED AVONEX®. AVONEX® in prefilled syringes must be stored in a 2-8°C (36-46°F) refrigerator. Once removed from the refrigerator, AVONEX® in a prefilled syringe should be allowed to warm to room temperature (about 30 minutes) and used within 12 hours. Do not use external heat sources such as hot water to warm AVONEX® in a prefilled syringe. DO NOT EXPOSE TO HIGH TEMPERATURES. DO NOT FREEZE. Protect from light. Do not use beyond the expiration date stamped on the syringe. Jacobs LD, et al. Intramuscular interferon beta-1a for disease progression in relapsing multiple sclerosis. Ann Neurol 1996;39(3):285-294. Jacobs LD, et al. Intramuscular interferon beta-1a initiated during a first demyelinating event in multiple sclerosis. NEJM 2000;343:898-904. Kurtzke JF. Rating neurologic impairment in multiple sclerosis: an expanded disability status scale (EDSS). Neurology 1983;33:1444-1452. ©2005 Biogen Idec Inc. All rights reserved. *Micro Pin® is the trademark of B. Braun Medical Inc. Please read this guide carefully before you start to use AVONEX® (a-vuh-necks) and each time your prescription is refilled since there may be new information. The information in this guide does not take the place of talking with your doctor or healthcare professional. What is the most important information I should know about AVONEX®? Depression-- Some people treated with interferons, including AVONEX®, have become depressed (feeling sad, feeling low or feeling bad about oneself). Some people have thought about killing themselves and a few have committed suicide. Depression is common in people with MS. If you are noticeably sadder or feeling more hopeless, you should tell a family member or friend right away and call your doctor as soon as possible. You should tell the doctor if you have ever had any mental illness, including depression, and if you take any medicines for depression. Liver problems-- Your liver may be affected by taking AVONEX® and a few patients have developed severe liver injury. Your healthcare provider may ask you to have regular blood tests to make sure that your liver is working properly. If your skin or the whites of your eyes become yellow or if you are bruising easily you should call your doctor immediately. Risk to pregnancy-- If you become pregnant while taking AVONEX®, you should stop using AVONEX® immediately and call your doctor. AVONEX® may cause you to lose your baby (miscarry) or may cause harm to your unborn child. You and your doctor will need to decide whether the potential benefit of taking AVONEX® is greater than the risks are to your unborn child. Allergic reactions-- Some patients taking AVONEX® have had severe allergic reactions leading to difficulty breathing. Allergic reactions can happen after your first dose or may not happen until after you have taken AVONEX® many times. Less severe allergic reactions such as rash, itching, skin bumps or swelling of the mouth and tongue can also happen. If you think you are having an allergic reaction, stop using AVONEX® immediately and call your doctor. Blood problems-- You may have a drop in the levels of infection-fighting blood cells, red blood cells or cells that help to form blood clots. If the drop in levels are severe, they can lessen your ability to fight infections, make you feel tired or sluggish or cause you to bruise or bleed easily. Seizures-- Some patients have had seizures while taking AVONEX®, including some patients who have never had seizures before. It is not known whether the seizures were related to the effects of their MS, to AVONEX®, or to a combination of both. If you have a seizure while taking AVONEX®, you should stop taking AVONEX® and call your doctor right away. Heart problems-- While AVONEX® is not known to have direct effects on the heart, a few patients who did not have a history of heart problems developed heart muscle problems or congestive heart failure after taking AVONEX®. Some of the symptoms of heart problems are swollen ankles, shortness of breath, decreased ability to exercise, fast heartbeat, tightness in chest, increased need to urinate at night, and not being able to lay flat in bed. If you develop these symptoms or any heart problems while taking AVONEX®, you should call your doctor right away. For more information on possible side effects with AVONEX®, please read the section on " What are the possible side effects of AVONEX ®?" in this Medication Guide. AVONEX® is a form of a protein called beta interferon that occurs naturally in the body. It is used to treat relapsing forms of multiple sclerosis. It will not cure your MS but may decrease the number of flare-ups of the disease and slow the occurrence of some of the physical disability that is common in people with MS. MS is a life-long disease that affects your nervous system by destroying the protective covering (myelin) that surrounds your nerve fibers. The way AVONEX® works in MS is not known. Who should not take AVONEX®? Do not take AVONEX® if you have had an allergic reaction (difficulty breathing, itching, flushing or skin bumps spread widely over the body) to interferon beta. Do not take the vial formulation of AVONEX® if you have a history of hypersensitivity to albumin (human). You should tell your doctor if you are taking any other prescription or nonprescription medicines. This includes any vitamin or mineral supplements, or herbal products. You should tell your doctor if you have had a natural rubber sensitivity since the AVONEX® prefilled syringe cap contains dry natural rubber, which may cause allergic reactions. How should I take AVONEX®? To get the most benefit from this medicine, it is important that you take AVONEX® exactly as your doctor tells you. AVONEX® is given by injection into the muscle (intramuscular injection) once a week, on the same day (for example, every Monday right before bedtime). If you miss a dose, you should take your next dose as soon as you remember. You should continue your regular schedule the following week. Do not take AVONEX® on two consecutive days. Take only the dose your doctor has prescribed for you. Do not change your dose unless you are told to by your doctor. If you take more than your prescribed dose, call your healthcare provider right away. Your doctor may want to monitor you more closely. You should always follow your doctor's instructions and advice about how to take this medication. If your doctor feels that you, or a family member or friend, may give you the injections, then you and/or the other person should be instructed by your doctor or other healthcare provider in how to prepare and inject your dose of AVONEX®. Do not try to give yourself injections at home until you are sure that you (or the person who will be giving you the injections) fully understands and is comfortable with how to prepare and inject the product. At the end of this guide there are detailed instructions on how to prepare and give yourself an injection of AVONEX® that will help remind you of the instructions from your doctor or healthcare provider. Always use a new, unopened AVONEX® vial or prefilled syringe for each injection. Never reuse the vials or syringes. It is important to keep your work area, your hands, and your injection site clean to minimize risk of infection. You should wash your hands prior to handling the syringe. It is important that you change your injection site each week. AVONEX® comes in two different forms (a powder in a single-use vial and a liquid in a prefilled syringe). See the attached appendix for detailed instructions for preparing and giving a dose of AVONEX®. These instructions are specific to the form of AVONEX® chosen for you by your healthcare provider. What should I avoid while taking AVONEX®? Pregnancy-- You should avoid becoming pregnant while taking AVONEX® until you have talked with your doctor. AVONEX® can cause you to lose your baby (miscarry). If you become pregnant while taking AVONEX® you should stop using AVONEX® immediately and tell your doctor. You and your doctor will need to decide whether the potential benefit of taking AVONEX® is greater than the risk to your unborn child. If you become pregnant while taking AVONEX®, consider enrolling in the AVONEX® Pregnancy Registry by calling 1-800-456-2255. Breast-feeding-- You should talk to your doctor if you are breast-feeding an infant. It is not known if the interferon in AVONEX® gets into the breast milk, or if it could harm your nursing baby. What are the possible side effects of AVONEX®? Flu-like symptoms-- Most people who take AVONEX® have flu-like symptoms (fever, chills, sweating, muscle aches, and tiredness) early during the course of therapy. Usually, these symptoms last for a day after the injection. You may be able to manage these flu-like symptoms by injecting your AVONEX® dose at bedtime and taking over-the-counter pain and fever reducers. For many people, these symptoms lessen or go away over time. Talk to your doctor if these symptoms continue longer than the first few months of therapy, or if they are difficult to manage. Thyroid problems-- Some people taking AVONEX® develop changes in the function of their thyroid. Symptoms of these changes include feeling cold or hot all the time, a change in your weight (gain or loss) without a change in your diet or amount of exercise you get, or feeling emotional. If you get any of the symptoms listed in this section or any listed in the section " What is the most important information I should know about AVONEX ®?" , you should call your doctor right away. Whether you experience any side effects or not, you and your doctor should periodically discuss your general health. Your doctor may want to monitor you more closely or may ask you to have blood tests more frequently. Medicines are sometimes prescribed for purposes other than those listed in a Medication Guide. This medication has been prescribed for your particular condition. Do not use it for another condition or give this drug to anyone else. If you have questions you should speak with your doctor or healthcare professional. You may also ask your doctor or pharmacist for a copy of the information provided to them with the product. AVONEX® in prefilled syringes should be refrigerated (36-46°F or 2-8°C). Once removed from the refrigerator, AVONEX® in a prefilled syringe should be allowed to warm to room temperature (about 30 minutes) and used within 12 hours. Do not use external heat sources such as hot water to warm AVONEX® in a prefilled syringe. Do not expose to high temperatures. Do not freeze. Protect from light. How do I prepare and inject a dose of AVONEX®? Find a well lit, clean, flat work surface like a table and collect all the supplies you will need to give yourself or receive an injection. Take one AVONEX® Administration Dose Pack out of the refrigerator about 30 minutes before you plan on injecting your dose to allow it to reach room temperature. A room temperature solution is more comfortable to inject. Check the expiration date. The expiration date is printed on the AVONEX® prefilled syringe, syringe package, and the carton. Do not use if the medication is expired. Check the contents of the syringe. The solution in the syringe should be clear and colorless. If the solution is colored or cloudy, do not use the syringe. Get a new syringe. Hold the syringe so the rubber cap is facing down and the 0.5 mL mark is at eye level. 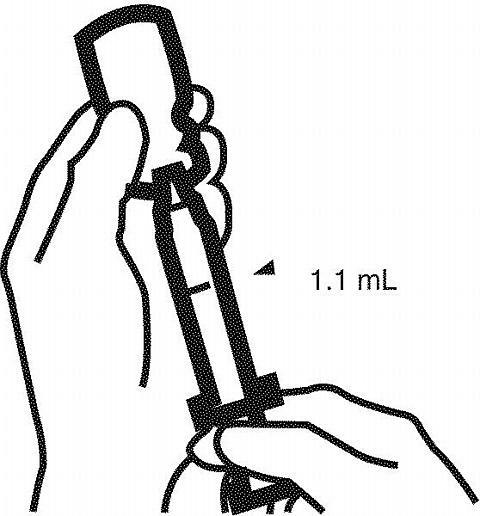 Check to make sure the amount of liquid in the syringe is the same or very close to the 0.5 mL mark. If the syringe does not have the correct amount of liquid, DO NOT USE THAT SYRINGE. Call your pharmacist. Hold the AVONEX® prefilled syringe upright (rubber cap facing up). 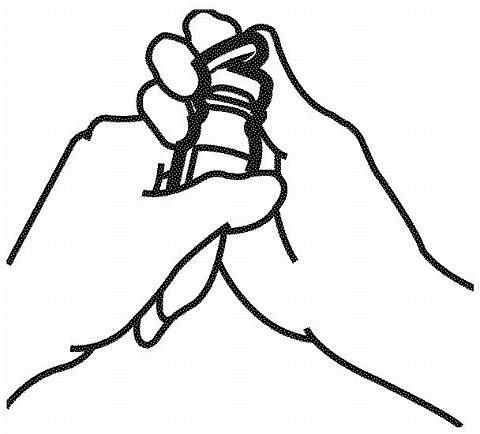 Remove the protective rubber cap by turning and gently pulling the cap in a clockwise motion. Open the package with the 23 gauge 1 ¼ inch needle. 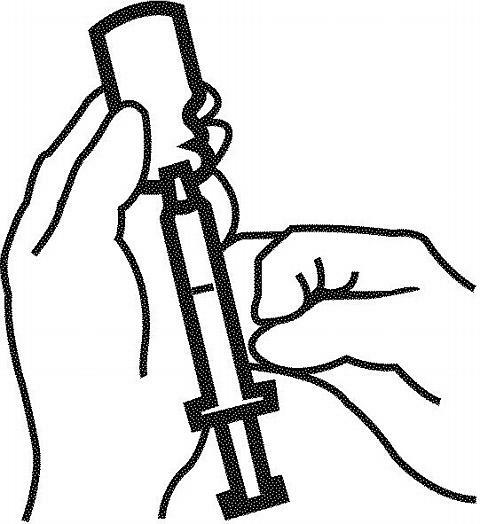 Attach the needle by firmly pressing it onto the syringe and turning it a half turn clockwise. NOTE: If you do not firmly attach the needle to the syringe, it may leak so you may not get your full dose of AVONEX®. You should use a different site each time you inject. This can be as simple as switching between thighs (if you are always injecting yourself), or if another person is helping you, you can rotate between your upper arms and your thighs. Keeping a record of the date and location of each injection will help you. Do not inject into an area of the body where the skin is irritated, reddened, bruised, infected or scarred in any way. Use the alcohol wipe to clean the skin at the injection site you choose. Then, pull the protective cover straight off the needle; do not twist the cover off. With one hand, stretch the skin out around the injection site. 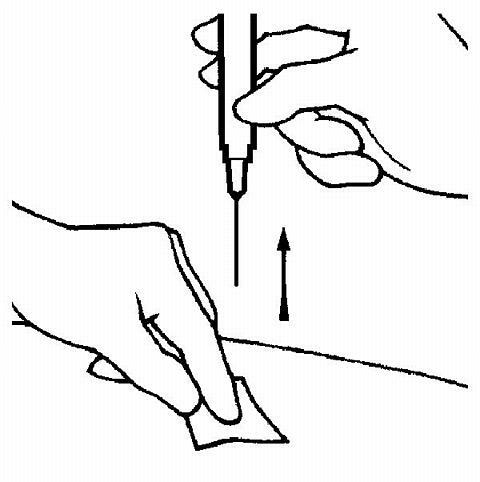 Hold the syringe like a pencil with the other hand, and using a quick motion insert the needle at a 90° angle, through the skin and into the muscle. Once the needle is in, let go of the skin and slowly push the plunger down until the syringe is empty. Take the gauze pad and hold it near the needle at the injection site and pull the needle straight out. Use the gauze pad to apply pressure to the site for a few seconds or rub gently in a circular motion. If there is bleeding at the site, wipe it off and, if necessary, apply an adhesive bandage. After 2 hours, check the injection site for redness, swelling or tenderness. If you have a skin reaction and it does not clear up in a few days, contact your doctor or nurse. Dispose of the used syringe and needle in your puncture resistant container. This is a single-use syringe. DO NOT USE a syringe or needle more than once. There may be special state and/or local laws for disposing of used needles and syringes. Your doctor, nurse or pharmacist should provide you with instructions on how to dispose of your used needles and syringes. Always keep your disposal container out of the reach of children. DO NOT throw used needles and syringes into the household trash and DO NOT RECYCLE. Prior to use, AVONEX® should be refrigerated (36-46°F or 2-8°C) but can be kept for up to 30 days at room temperature (77°F or 25°C). You should avoid exposing AVONEX® to high temperatures and freezing. After mixing, AVONEX® solution should be used immediately, within 6 hours when stored refrigerated at 36-46°F or 2-8°C. Do not freeze the AVONEX® solution. Find a well-lit, clean, flat work surface like a table and collect all the supplies you will need to give yourself or receive an injection. You may want to take one AVONEX® Administration Dose Pack out of the refrigerator about 30 minutes before you plan on injecting your dose to allow it to reach room temperature. A room temperature solution is more comfortable to inject. a puncture resistant container for disposal of used syringes, needles, and MICRO PINS. It is important to keep your work area, your hands, and your injection site clean to minimize risk of infection. You should wash your hands prior to preparing the medication. Check the expiration date on the AVONEX® vial and the vial of diluent; do not use if the medication or diluent is expired. Remove the caps from the vial of AVONEX® and the vial of diluent, and clean the rubber stopper on the top of each vial with an alcohol wipe. 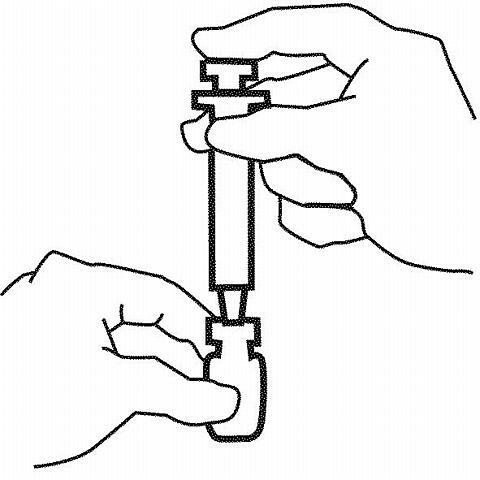 Attach the blue MICRO PIN® to the syringe by turning clockwise until secure. NOTE: Over-tightening can make the MICRO PIN® difficult to remove. Pull the MICRO PIN® cover straight off; do not twist. Save the cover for later use. Pull back the syringe plunger to the 1.1 mL mark. Firmly push the MICRO PIN® down through the center of the rubber stopper of the diluent vial. 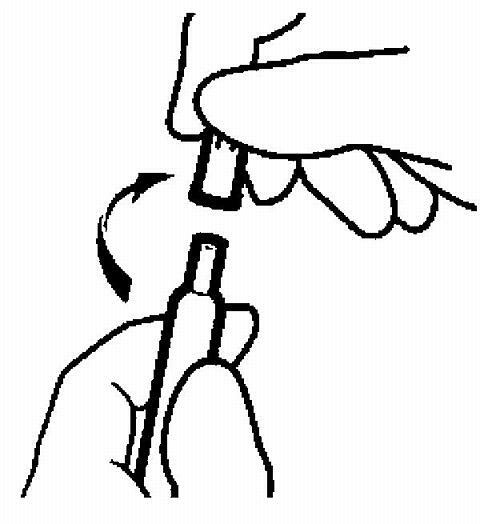 Inject the air in the syringe into the diluent vial by pushing down on the plunger until it cannot be pushed any further. Keeping the MICRO PIN® in the vial, turn the diluent vial and syringe upside down. While keeping the MICRO PIN® in the fluid, slowly pull back on the plunger to withdraw 1.1 mL of diluent into the syringe. Gently tap the syringe with your finger to make any air bubbles rise to the top. 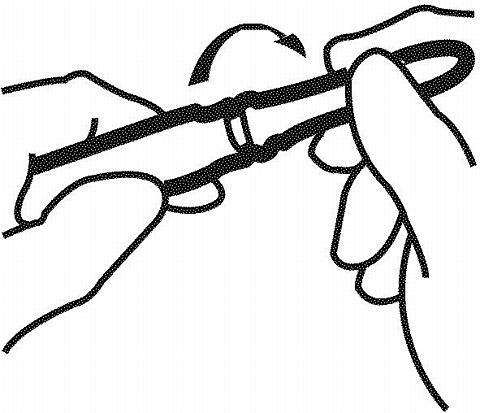 If bubbles are present, slowly press the plunger in (to push just the bubbles out through the needle). Make sure there is still 1.1 mL of diluent in the syringe. Slowly pull the MICRO PIN® out of the diluent vial. Carefully insert the MICRO PIN® through the center of the rubber stopper of the vial of AVONEX®. NOTE: Off-center punctures can push the stopper into the vial. If the stopper falls into the vial, do not use. Slowly inject the diluent into the vial of AVONEX®. DO NOT aim the stream of diluent directly on the AVONEX® powder. Too direct or forceful a stream of diluent onto the powder may cause foaming, and make it difficult to withdraw AVONEX®. Without removing the syringe, gently swirl the vial until the AVONEX® is dissolved. DO NOT SHAKE. Check to see that all of the AVONEX® is dissolved. Check the solution in the vial of AVONEX®. It should be clear to slightly yellow in color and should not have any particles. Do not use the vial if the solution is cloudy, has particles in it or is a color other than clear to slightly yellow. Turn the vial and syringe upside down. Slowly pull back on the plunger to withdraw 1.0 mL of AVONEX®. If bubbles appear, push solution slowly back into the vial and withdraw the solution again. With the vial still upside down, tap the syringe gently to make any air bubbles rise to the top. Then press the plunger in until the AVONEX® is at the top of the syringe. Check the volume (should be 1.0 mL) and withdraw more medication if necessary. Withdraw the MICRO PIN® and syringe from the vial. 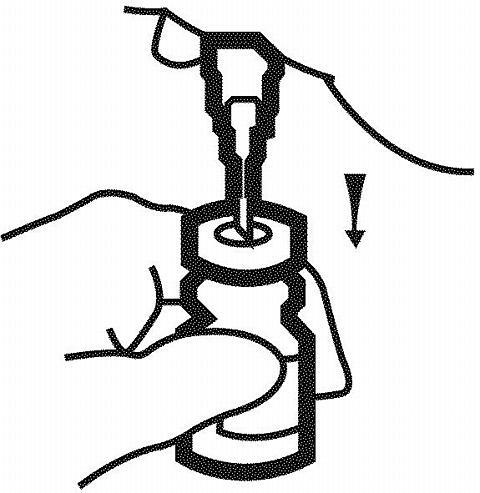 Replace the cover on the MICRO PIN® and remove from the syringe with a counterclockwise turn. 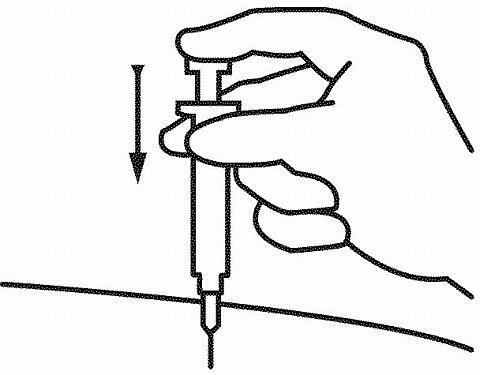 Attach the sterile needle for injection to the syringe turning clockwise until the needle is secure. A secure attachment will prevent leakage during the injection. Use a new alcohol wipe to clean the skin at one of the recommended intramuscular injection sites. Then, pull the protective cover straight off the needle; do not twist the cover off. Once the needle is in, let go of the skin and use that hand to gently pull back slightly on the plunger. 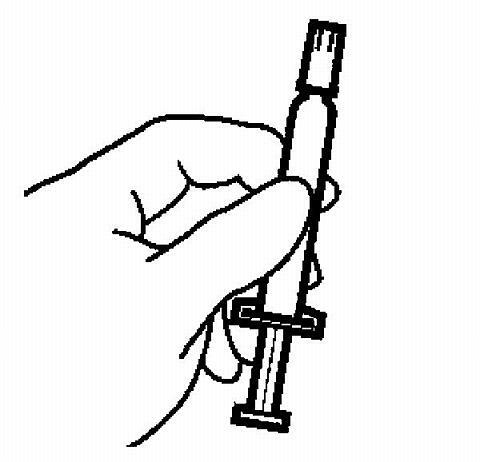 If you see blood come into the syringe, withdraw the needle from the injection site and put pressure the site with a gauze pad. You will need to replace the needle and choose clean a new site for injection. If no blood came into the syringe, slowly push the plunger in the syringe is empty. 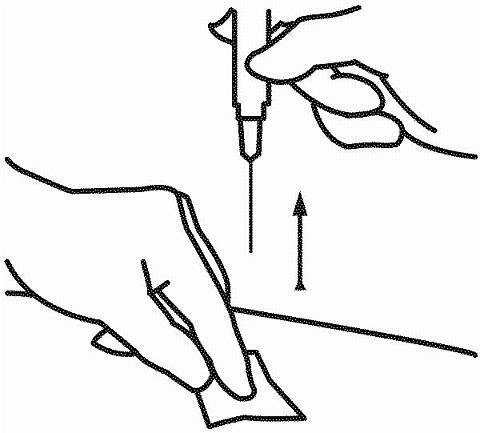 Hold a gauze pad near the needle at the injection site and pull the needle straight out. Use the pad to apply pressure to the site for a few seconds or rub gently in a circular motion. 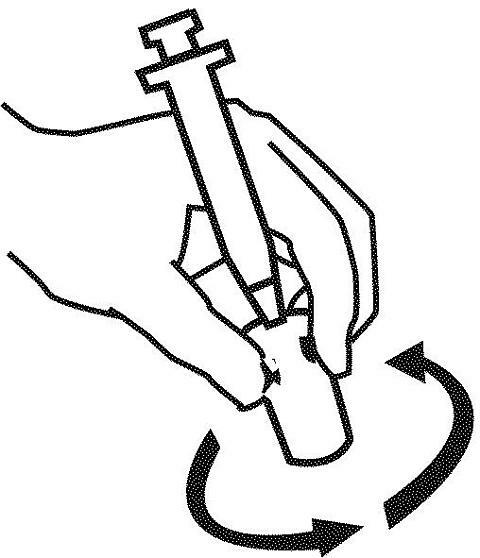 Dispose of the used syringe, needle and blue MICRO PIN® in your puncture resistant container. DO NOT USE a syringe, MICRO PIN®, or needle more than once. The AVONEX® and diluent vials should be put in the trash.